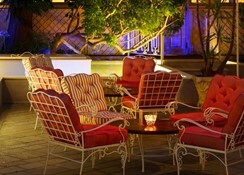 The Bella Venezia Hotel is a luxury hotel in Corfu, Greece. The nearest coast is just 1km away from the hotel. The hotel houses its own restaurant and bar that serve a wide range of delicacies from the local Greek and other International cuisines. The bar offers local wines, beers, signature cocktails, alcoholic and non-alcoholic beverages. The property is set up in a tastefully renovated neo-classical mansion, that houses 31 soundproofed rooms, equipped with all the amenities required for a comfortable stay. The hotel’s décor features motifs of Greek architecture. The proximity of the hotel to the coast and the urban Corfu makes it for a perfect destination for vacationers looking to have a sunny holiday and explore the culture and heritage of Greece. 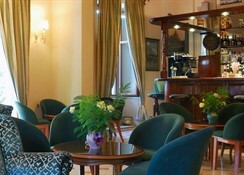 The Bella Venezia Hotel is located 2.1km away from the Corfu International Airport and 123km from the Ioannina Airport. The town centre of Corfu is just 700m away from the hotel. The closest coast is 1km away. The public bus station is 550m away from the hotel complex. Local landmarks like Public Library, Serbian Museum, Archaeological Museum, Solomos Museum, Museum of Ceramic Art, Theotoki G. Square, Municipal Gallery, Kolla Square, Museum of Banknotes and Saint Spyridon Church are located within a distance range of 500m from the hotel. Also, Asian Art Museum, D.Solomos Museum, Byzantine Museum, Panagia Vlahernon Church, Port of Corfu, Mon Repos Palace, Vido Island, Pontikonisi, Achilleion Palace and Butrint National Park are located within a distance range of 17km from the hotel. For the guests’ local excursions, the hotel can arrange for rental cars on special request. Airport pick-up and drop-off can also be arranged by the hotel staff. The Bella Venezia Hotel has 31 soundproofed, tastefully-decorated rooms that ensure the guests have a cosy, luxurious stay they expect. 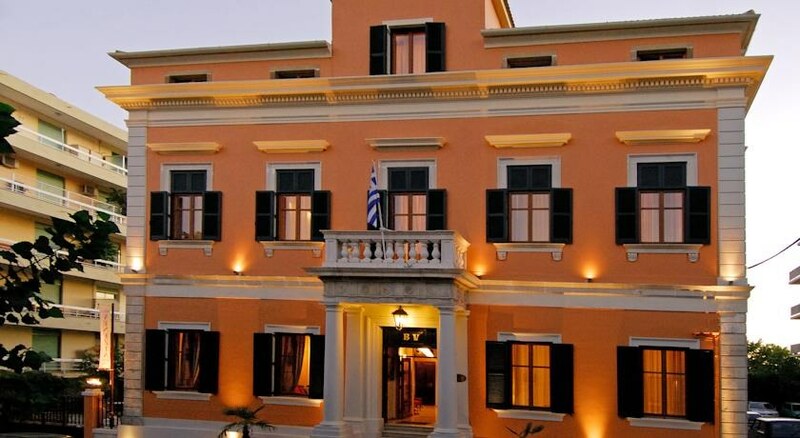 The hotel is housed in a renovated neo-classical mansion featuring prominent bright colours and Greek architecture. The rooms are further categorised into 7 types based on amenities and number of beds. Deluxe Double Room with Balcony, Classic Double or Twin Room with Balcony, Comfort Venezian Loft, Classic Double or Twin Room, Classic Single Room, Venezian Loft Single and Master Suite are the types of rooms available at the hotel. 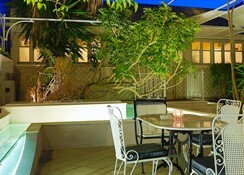 The rooms are equipped with all facilities and amenities essential for a comfortable stay. The rooms are equipped with individually controlled air conditioning unit, telephone, mini fridge, armchair, free Wi-Fi access, LCD television, hairdryer, bed linen, hypoallergenic pillows and mattresses, bathroom with bathtub and/or shower, bath linen, hair dryer, slippers, essential toiletries, etc. The Bella Venezia Hotel houses a restaurant and a bar that serve breakfast, lunch, dinner and snacks in buffet and A ’la Carte style. 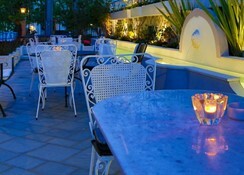 The food served includes dishes from traditional Greek and international cuisines. The bar serves a wide range local wines, beers, cocktails, alcoholic and non-alcoholic beverages. The restaurant and bar have been designed and decorated by professional interior designers and keep up with the English and Greek architectural motifs. 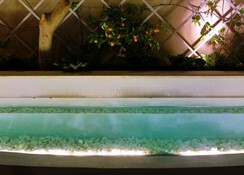 The guests can also visit the Corfu town, which is nearby, and try local hotels and bars. 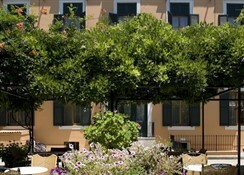 The Bella Venezia Hotel has a beautiful terrace and garden where the guests can relax and unwind. The guests can also enjoy sunbathing at the nearby beach. If interested, one can try water sports offered at the nearby beach. The guests can also hire a rental car and visit Corfu and other nearby towns for sightseeing.